Ok, wow. It’s been an incredibly busy fall. Training has been going well since the speed order, and my body seems to be holding up with the transition back to sculling, erging and lifting weights. Taking some time away from the sweep motion seems to be a good move for me at the moment, and I am looking forward to doing some more cross training over break to continue building up strength and integrity in my shoulder. We finished up training in Princeton with an erg test yesterday that was…only ok. Coming back after Thanksgiving, I was feeling really strong and confident with the direction things were going on the erg. The test this week was my second-fastest time, but still a good ways off of my PR from last spring. Overall it was not an easy test, and I didn’t feel like I ever found a groove to just dig in and work. The best way I can describe it is that it felt very amateur: not at all how I usually test. Tests are never supposed to be easy, but I find that I can make them easier on myself by working in a rhythm, having a plan, and executing realistic goals. This wasn’t really any of those things. But: something tells me that I’ll have another shot at the erg at some point this season to have a better test. So while this week left me a little underwhelmed, looking back on this fall I have to say that I’m pretty impressed with the amount of work the Team did off the water. Starting in October, there was nary a weekend that we didn’t have some sort of event or appearance; whether for USRowing or Power and Grace–the ladies of the USTC were busy this season getting out into the community fundraise and network in order to support our goals for 2012. NYAC never disappoints, and this year was no exception. The All-Sports Dinner is an annual event for club members and athletes to come together to celebrate the achievements of NYAC athletes and teams. For me this is a great event to attend because it offers me a rare opportunity to spend time with other elite athletes from low-profile Olympic sports (judo, water polo, fencing, wrestling, etc. ), plus the NYAC rowing family are some of the best, most genuine people on the planet. The director of the rowing program, Vinny Ventura, as well as John FX Flynn have been huge supporters of myself and several other USA athletes while I’ve been on the Team, even when I come home from Worlds without a gold medal every year. I’m able to do what I do in pursuit of my goals in part because of what Vinny and the NYAC do for me, and I am so grateful to be a part of the best athletic club in the world. Plus, they throw the best parties. This year the keynote speaker was Joe Namath, and he was great! Sarah Z., me, Jamie and Ellen with our YMCA "mom", Miss Cathy! 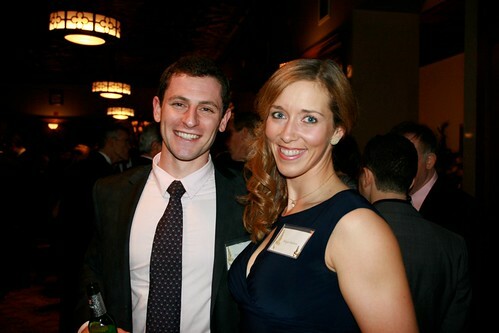 A smaller and more local affair, this was an event put on by the Princeton National Rowing Foundation to help generate more financial support for our Team in the Princeton community. Spearheaded by our great Team Doc, Dr. Timothy Hosea, we had a small cocktail/dinner party on a Friday night in Princeton at the Drumthwacket Garden House and it was awesome. Having the opportunity to interact with donors and supporters in a social setting is a nice change for us, since we so very rarely get to meet face to face with people who donate to the Team. That we got to do it in cocktail dresses while eating chicken skewers was just an added bonus. As a surprise ending to the evening, I was presented with an award for Olympic Training Site Athlete of the Year from the PNRA (aka Finn M.W. Caspersen Training Center), which was humbling and exciting. Thanks Jon for being my plus one! The first annual, and now slated to become a regular thing which is VERY exciting. Also hosted at the New York Athletic Club, this was by far the nicest USRowing event I’ve ever been to and easily the most fun. Annual award recipients were honored during the dinner program–which was nice–but the highlight for me was the reception and getting to see so many friends during the cocktail “hour” (we had to be dragged to the dinner tables). As I wrote that night on the way home… rowing parties never last long enough. Looking forward to next year and topping the shoulder-pad/fur stole ensemble I put together this year. I don’t think I got turned down once. Which, I think, is less a testament to my sales ability and more to the warmth and generosity of the rowing community toward our cause, but I digress. The convention was a fun stopover for the weekend and again it was good to catch up with a few friends. Also refreshing to get out of Princeton for the weekend and shake up the routine a little bit (weekend routine = sit on couch in sweat pants and watch Netflix streaming on AppleTV while eating almost continuously). Add to all of that calendar signing and selling events almost every weekend, and I didn’t spend much time at home this fall. As you may have gathered from reading my blog, I love having opportunities to socialize with other athletes and members of the rowing community (especially while dressing up and possibly having a glass of wine)… the sense of community we collect at events like this, plus the stories we hear (and re-hear) and nuggets of wisdom we pick up along the way make for no complaints from me. I only hope that we can continue to maintain this momentum and further develop the relationship between the Team and the amazing people out there who support us. So on that note… do you have your Power and Grace Calendar yet? Everyone please have a safe and happy Holiday! Question – why were you put in sweep boats through the fall training?